Simplifying my bathroom was the toughest challenge I faced on the path to living a more low waste lifestyle. Some areas were relatively easy to simplify while others were an uphill battle, and I’m still trying to figure things out! 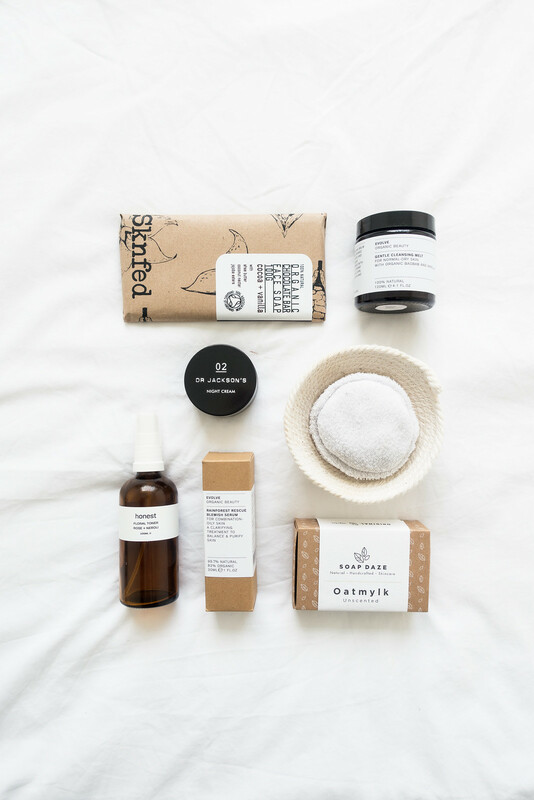 The process of seeking out low waste alternatives for necessary bathroom products can be incredibly frustrating and almost impossible, in some cases, to find ones that are also cruelty-free. If you’re feeling disheartened by how daunting the challenge seems when trying to reduce your impact and lessen your waste, know that every change we make adds up over time. Every successful habit shift or eco-friendly switch makes a difference. So do what you can, when you can. I thought a guide to creating a low waste bathroom would be a good way of sharing what I’ve learned about making these changes, what my essentials are and where to find them. Every product I've mentioned is vegan-friendly, low waste to varying degrees, and available in the UK. 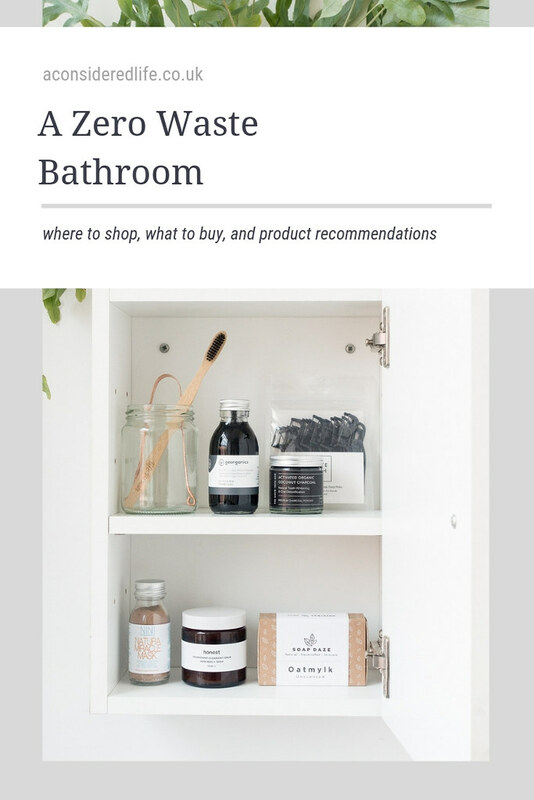 I’ve tried to take the leg work out of making better choices with a guide to where to shop and what to buy for a zero waste bathroom. Hand Soap, Body Wash, Shaving Foam: All three can be covered with one product: bar soap. My favourites come from Soap Daze (there's also a soap on a rope* version), Friendly Soap, and Ravenscourt Apothecary Soap but if you really do prefer liquid soap, the REN Atlantic Kelp And Magnesium Anti-Fatigue Body Wash* bottle is made using ocean plastic. Using a soap bag will get the most out of your bar soap. Bubble Bath, Bath Soaks, Bath Scrubs: LUSH offer a range of cruelty-free zero waste bath products from bath bombs and jelly bombs to bubble bars and bath oils. You could also make your own bath salts using simple ingredients. Tropic Skincare also make a Body Smooth Refreshing Polish that comes in a reusable pot. Loofahs, Brushes: You could use a natural loofah pad or a body brush, both are great for exfoliating and cleaning the skin. Hair Removal: Zero wasters rave about using a Merkur Safety Razor and blades, if that's your thing you might like the Naked Necessities Shaving Kit. I'm not keen on using a razor on sensitive areas and having a multipurpose tool makes more sense to me. I own a Braun Silk-épil 7 Wet & Dry epilator, which can be used as a trimmer as well as an epilator so I can use it everywhere I want to remove hair. Deodorant: The only natural deodorant I'll use and recommend is Salt of the Earth Natural Deodorant because it's so effective even if it takes a bit of getting used to. Every other natural deodorant I’ve tried didn't work and irritated my skin. While this brand does come packaged in plastic, the deodorant itself lasts years although this one is plastic-free - just remember to request plastic-free delivery! Nuud Care Deodorant has sustainable packaging, production, and distribution; it's said to last seven days! I'm looking forward to putting it to the test. Perfume: If you’re like me and enjoy wearing perfume then you might be looking for a low waste and cruelty-free solution. Eden Perfumes make 100% vegan perfumes made with ethically sourced organic ingredients designed to imitate famous scents - without the cruelty. They're incredibly affordable and offer refills to limit waste. Cotton Buds: I've tried to live without these altogether but they are undeniably handy to have. Simply Gentle Organic Cotton Buds and Go Bamboo Cotton Buds are made from cotton and bamboo, and are 100% biodegradable. Toilet Paper: Who Gives A Crap makes the best quality eco-friendly toilet paper I’ve tried although requires a budget to buy in bulk, read more in my review. An alternative even more low waste solution would be to install a bidet shower, which would cut down your paper use and save you money. Feminine Hygiene: If I had a need for them, I’d try a menstrual cup like the Mooncup, DivaCup, or Lunette. There are also eco-friendly options for both tampons and pads if the menstrual cup isn’t suitable for you. Makeup has been one of my biggest challenges when making low waste switches. Finding effective and affordable low waste makeup products that are also vegan-friendly is tough, there are very few options. My solution? To reduce the waste I cause by minimising the makeup I wear. I go makeup free most of the week; I don't wear foundation or nail polish at all, and I don't buy any more than I need. As I use my current favourites up, I'm looking to replace them with low waste alternatives. Zao offers cruelty-free, vegan-friendly, refillable and sustainable makeup products. They have a range of zero waste foundations, primers, and concealers, as well as eyeshadows, and lip products. Hynt Beauty sold through Glow Brighton has a range of vegan-friendly makeup with a couple of low waste options like the concealer. Luna Beauty have a limited range of vegan-friendly, low waste makeup products with 15% discount on any refill order. Some Kjaer Weis products are vegan-friendly, as are some of the LUSH range. Shampoo & Conditioner: I’m able to refill bottles of Faith In Nature shampoo and conditioner at my local zero waste store but if you don’t have that option, Hairy Jayne offers shampoo and conditioner, which you can then order refills* for making zero waste hair care a breeze. Hair Treatments: If you need to repair damage or deep condition your hair, LUSH is the best place for vegan-friendly zero waste hair treatments from conditioning moisturisers, colour care, hot oils, and scalp treatments. Hair Jayne has a Pre-Shampoo Treatment Oil and Conditioning Detangler packaged in reusable bottles. Hair Oil, Frizz Control, Heat Protection: The best way to protect against heat is to avoid using it to style your hair. I use Melvita L’Or Bio Extraordinary Oil for creating a glossy, smooth finish. It comes in a glass bottle, which is reusable and recyclable and it's made from a blend of 100% natural oils formulated to nourish and protect the hair and skin. The Hair Jayne Heat Protection adds shine and freshness to your hair while protecting against heat styling. Hair Styling: I don't use styling products so I have no recommendations to speak of but LUSH have a good range of hair styling products including Hair Wax, Sea Spray, Styling Cream, and Hair Gel. Hair Brush, Hair Combs: There are very few vegan-friendly plastic-free options when it comes to hair brushes. The Cebra Eco-friendly Sisal Hairbrush looks great, and they have a few options to choose from, but I find these types of brushes cause frizz. I use a Tangle Teezer, which I've had for years and a metal comb. Hair Ties, Hair Bands, Hair Sticks: It's almost impossible to find hair ties or bands that aren't made of plastic or packaged in it. Hair ties are really easy to make (follow my guide) but there are better alternatives. If you want to wear your hair up, try SAYA Designs hair sticks. They have hair sticks, slides, and forks for all hair types each one made from roots salvaged from old plantations. Skincare is a lot easier than makeup when looking for low waste vegan-friendly options. I try to keep my skincare routine as simple as possible to reduce waste but sometimes my skin calls for specialised products in which case I look for low waste packaging I can reuse or recycle. Cleanser: I decant coconut oil from our kitchen supply to use as a cleanser, however, it’s quite rich and you have to make sure you remove all traces to prevent congestion. You could also make your own DIY oil cleanser. The Dr. Jackson's Coconut Melt* and Evolve Beauty Gentle Cleansing Melt* are both low waste cleanser options. Toner: Using a toner after cleansing can help lift any leftover residue and prep your skin for moisturising. I either make my own using this DIY toner recipe, or the Honest Skincare Floral Toner and Evolve Beauty Daily Defence Moisture Mist are both good low waste options. Moisturiser: Sweet almond oil, purchased online in a glass bottle, works well for me as a moisturiser. When my complexion needs something more intensive I opt for a moisturiser like the Dr. Jackson's Night Cream*. It comes in a glass pot that can be reused (great for packing skincare for travel!) or recycled. If you prefer using oil as a moisturiser, the Dr. Jackson's Everyday Oil* is a nice option to have. Body Moisturiser, Body Lotion, Body Oil: Coconut oil and sweet almond oil mixed together make a wonderful body oil or for something more luxurious the Melvita L’Or Bio Extraordinary Oil is a great option. But if you want a lotion or moisturiser try the Beauty Kubes Body Cream, Bio Happy Mimosa Multi-Purpose Cream, or Basis Sensitiv Organic All Round Cream. Sun Protection: Low waste vegan-friendly sun protection is tough to find in the UK. LUSH offers three sun care products: Sesame Suntan Lotion, Powdered Sunshine, and The Sunblock but nothing over SPF 30. If you're in the US, the Avasol Surfer's Barrier Stick is a good zero waste option. I would warn you against making your own sunscreen as some zero wasters have suggested as you won't be able to calculate the SPF and your health isn't worth the risk. Face Mask: A simple DIY facial scrub is brown sugar mixed into coconut oil or banana and oat face mask, both work well at treating a dry complexion and can be used on your face and body. The Evolve Beauty Radiant Glow Mask* and the NINI Organics Natura Miracle Mask* are both low waste alternatives packaged in reusable glass pots. Spot Treatment: When I get spots I want them dealt with fast. I haven’t found too many spot treatment options, however, I’m currently using Evolve Beauty Rainforest Rescue Blemish Serum* and it’s working wonders. You can dab it onto spots directly or apply all over your face to treat congested skin. Multi-Pupose Balms: I use Boiron Homeoplasmine Cream to protect and heal skin especially chapped lips. It’s packaged in metal with a tiny plastic lid and one 40g tube lasts me an entire year. Coconut oil and sweet almond oil can be used as lip balm and hand cream but if you’re looking for specific products I have a couple of recommendations. Honest Skincare make a wonderful Lip Care lip balm (you can return the pots for reuse) and Big Green Tree make an Intensive Hand Balm in a reusable, recyclable metal pot. Face Cloths: I invested in washable cotton pads a year or so ago and haven’t looked back. I recommend the Love the Planet Washable Cotton Pads because they’re a good size and wash really well. The Soap Daze Reusable Face Cleansing Pads are a good option too. Toothbrush: I've chosen to stick with using an electric toothbrush although I do pack a bamboo one when I'm travelling. 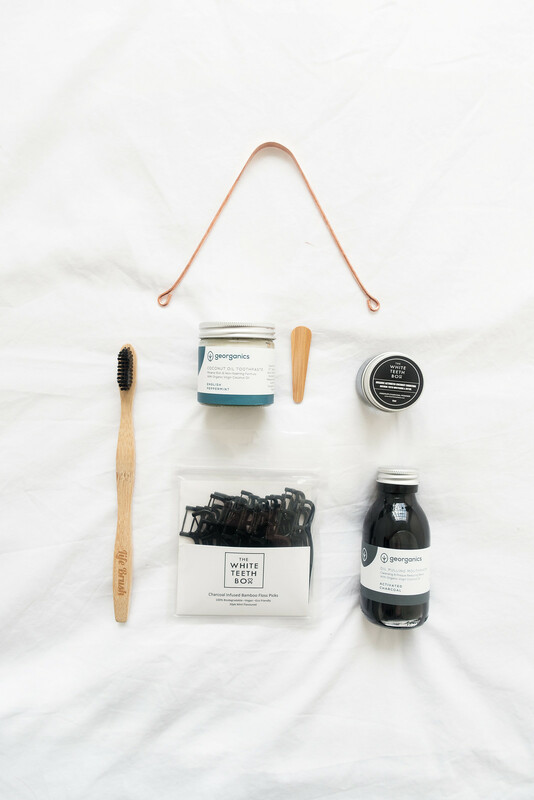 If you’re keen to make the switch, I can recommend The White Teeth Box Bamboo Toothbrush*, which is made using sustainably grown bamboo and the handle is compostable. Toothpaste: I’m not convinced DIY toothpaste is a good idea and I wouldn't recommend trying it. I use Colgate Tooth Powder, which contains fluoride, or Activated Organic Coconut Charcoal Powder*, which helps naturally whiten teeth. Alternatively you could use Georganics Coconut Oil Toothpaste* but neither of these plastic-free options contain fluoride. Denttabs Toothpaste Tablets, however, do contain fluoride; they're vegan-friendly but not entirely plastic-free. Dental Floss: Low waste vegan floss exists! Georganics Natural Dental Floss is all-natural made using sustainably grown bamboo, candelilla wax, and peppermint oil in a refillable, recyclable tube. If you prefer floss picks, The White Teeth Box Charcoal Infused Bamboo Floss Picks* are vegan and 100% biodegradable. Mouthwash: Oil pulling takes a bit of getting used to but I believe it’s better at cleaning your teeth than generic mouthwash. 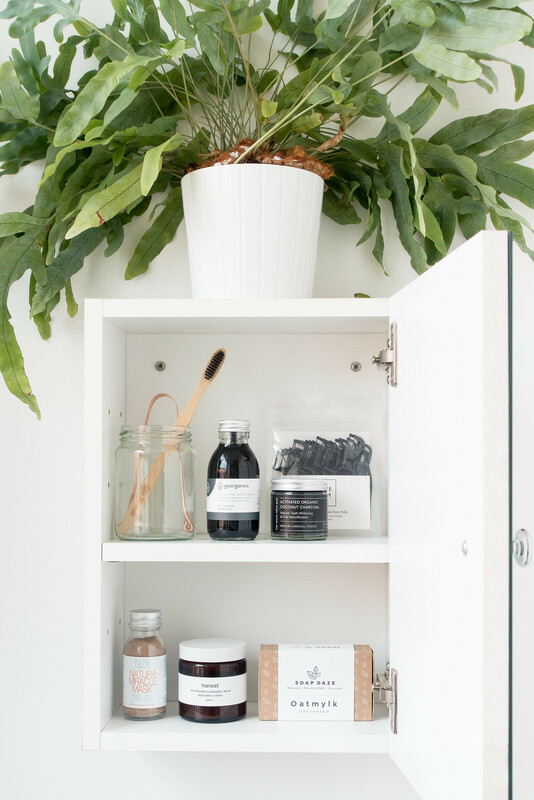 I keep my bathroom cabinet stocked with Georganics Coconut Oil Pulling Mouthwash*. You can make your own by mixing water, peppermint oil, and clove oil, it’ll make your breath smell nicer but it won’t necessarily clean your teeth. Tongue Scraper: Tongue scraping is weird but it’s a good habit to get into. You can pick copper tongue scrapers up online for cheap and with very little packaging from eBay or Etsy (don’t forget to ask the seller for no plastic). Health Care: When it comes to health care finding low waste (or even vegan-friendly) solutions isn't really something I consider to be a worthwhile concern especially since it's often not even possible. If you need medical supplies, supplements, or painkillers - take them. If there's a low waste vegan option, great; if not, don't worry. Cleaning Supplies: To clean my bathroom I use the bio Multi-Purpose Sanitiser purchased from my local bulk store, a steam cleaner with washable pads, and Ecoegg Bamboo Reusable Kitchen Towels. Unfortunately these do come packaged in plastic but one pack lasts for around 1700 uses; alternatively you could make your own. If you don't have access to a bulk store for cleaning supplies, Ethical Superstore has a great range of cleaning and household supplies. Buy in bulk and you'll reduce your waste. If possible, avoid using bin liners in your bathroom but if you must, there are some recycled, degradable, and compostable options. 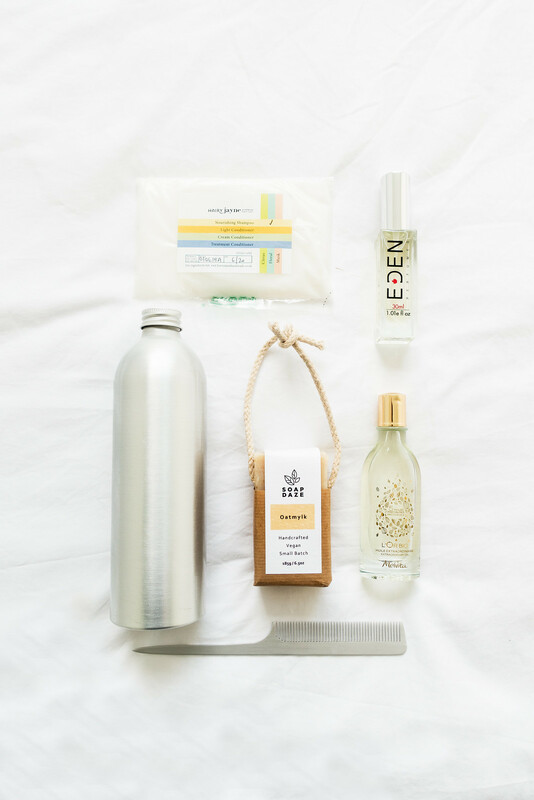 What bathroom products do you struggle to find plastic-free? Let me know and I'll see if I can help!